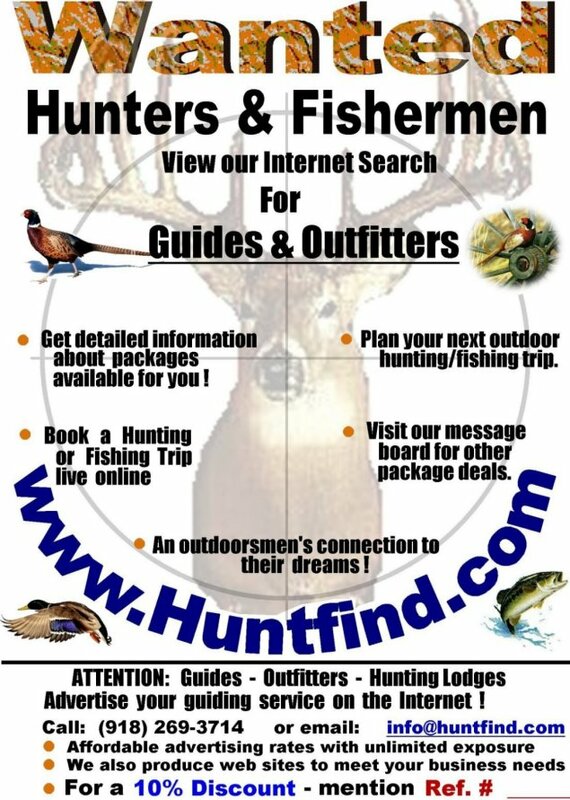 Become a partner of Huntfind.com by promoting out outdoor network of hunting and fishing guides and outfitters. Copy this text to your web page. Change ### to the Ref. number that was e-mailed to you. Too apply for a Ref. No. - See Below. Promote Huntfind.com by placing advertisements up in your local hunting lodges and supply stores. Write your Ref. that was e-mailed to you on each Poster so Guides can reference you. Click on the picture to the left to open it in a new Explorer window. The print margins for the page will need to be set to .50 on the top and bottom and .75 on the sides. This can be done in the File Properties of your browser, under the Page Setup option. Also remove the header and footer information so that it does not print on the Poster. After all this is done, go ahead and print the poster through Explorer or Netscape. Click on the picture to the left with your Mouse button. A new window will open with the downloadable file, follow the instructions on that page. The full page ad is 697K and the two 8x5 ad is 962K. Interested in becoming a partner with Huntfind? Copyright © 2009 HuntFind Guides and Outfitters Inc.